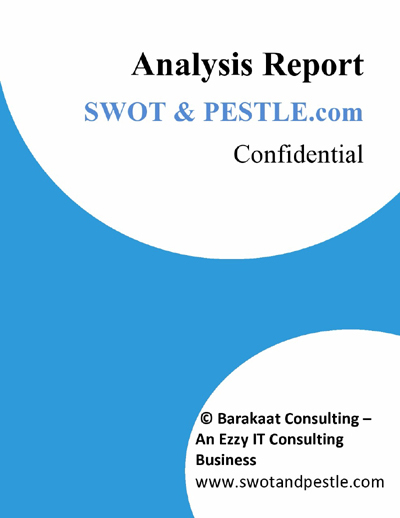 This report is shared in order to give you an idea of what the complete SWOT & PESTLE analysis report will cover after purchase. We invest deep in order to bring you insightful research which can add tangible value to your business or academic goals. We also guarantee that you cannot find matched quality at such competitive and economic pricing. 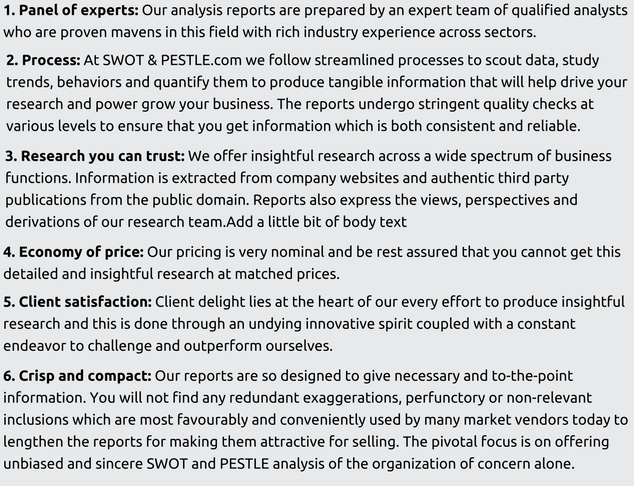 Get the summary SWOT & PESTLE.com report delivered straight to your email inbox for free. Our insightful and holistic reports have helped corporate,academia and researchers to take their research forward. Like us on Facebook to stay updated with the latest published SWOT & PESTLE Report. Netflix is an American entertainment company that has now become a leading internet television provider. It has a vast member base of over 93.8 million members spread out across over 190 countries, with more than 50 million being in the United States alone. The Company was founded by Reed Hastings and Marc Randolph in 1997. The headquarters are located in Los Gatos, California. While it originally confined itself to streaming media and providing DVDs for sale and rent, it has now expanded into television and film production. In 2016 alone, it has released an estimated 126 original films which is more than that achieved by any cable provider globally. Institutional ownership of shares of Netflix stands at 82.65% which is distributed between Capital Research Global Investors (10.36%), Vanguard Group Inc. (6.50%), FMR LLC (5.62%), Blackrock Inc. (4.07%), SSgA Funds Management, INC. (3.92%). Insider ownership is 0.15% which is held between Reed Hastings, Jay C Hoag and Neil D. Hunt. This ownership distribution is true as of May 2018. The SWOT analysis comprising of factors influencing the internal analysis and external analysis of Netflix are presented below in a matrix. The SWOT analysis report for Netflix essays the detailed strengths, weaknesses, opportunities and threats of this streaming mogul which has traversed a rich trajectory in online media space from DVDs, TV, videos and now movies. The sharp appreciation in share price and company valuation of Netflix from around $12 in Dec 2012 is an indicator of its increasing strengths and market growth strategy. This is the sample complete report which will give you a glimpse of what your complete report will cover after purchase. This report contains the table contents only. In case you need the complete report please purchase using the buy options displayed. * By clicking on "Buy Now" you agree to accept our "Terms and Conditions." 1. World’s leading video streaming network: Netflix, the World’s leading internet television network with over 93 million viewers as of 2017. The company offers 7,500 HD videos which is twice as many as rival Amazon Prime. Currently Netflix service is available in over 190 countries with targeted content depending on the taste and preference of the country. Netflix’s ecosystem for internet-connected screens with increasing amounts of content that enable its consumers access to TV shows and movies directly is its major strength. The ecosystem is supported by rich technologies such as big data which help in facilitating the company’s algorithms and analytics which lends it a great competitive advantage and helps in delivering an exceptional customer experience. 2. Increasing paid membership aiding business growth: Netflix has continued to grow its streaming service both domestically and internationally. For the third quarter in 2017 there was a 33% year-on-year growth in the total global subscriber revenue with the operating income doubling year-over-year to $209 million. In 2017, unique audiences visiting the Netflix increased by 48% compared to 2016. The total paid memberships at end of Q3-FY17 stood at 104.02 million compared to 83.28 million a year ago. The company is on track to achieve $11 billion in revenue in 2017 while delivering growth across markets globally. The company further aims to achieve improvement in international profitability with growth in operating margins which will enable it to further invest in potential growth markets. 3. Strong focus on innovation in technology and development: To provide best user experience Netflix heavily invested on Network Servers, Internet connection with different ISB around the World and codex (Incredible picture quality for least MB used) and to get best user experience on both mobile and desktop/laptop platforms. The company also strongly focuses on content and availability on each screen size. In an interview with Mobile World, Netflix CEO Reed Hasting indicated that the focus of the company remains on collecting stories and sharing it around the World and not on the screen size. They want to be as flexible as possible in screen size and needed to be available on all possible screen size. The remaining section under "Strength" is available only in the 'Complete Report' on purchase. This section is available only in the 'Complete Report' on purchase. The PESTLE/PESTEL analysis essays in detail the prime factors which influence the macro-environment of the media and entertainment industry for Netflix. Significant factors or influencers that comprise of political, environmental, social, economic, technological, legal and environmental aspects impacting sustenance and growth of Netflix in the ever competitive online streaming content industry determines strategic decisions the Company must adopt to thrive and grow. It must invest in cutting edge technology to offer seamless streaming experience to a rapidly surging audience to gain competitive advantage over its rivals Amazon and Hulu Plus. Find below the competitive analysis of Netflix presented in a matrix. 2. Increase in personnel related cost due to increase in workforce. Apart from this third party expenses, general and administrative expenses and facility related cost hikes contributed to overall rise in expenditure. 2. Netflix is still not present in the most populated country i.e. China due to permission issues from Chinese Government: China which is the most populated country in the world is still untapped by Netflix as it needs to get permission from their government, which has stringent rules when it comes to online censorship. The remaining section under "Political" is available only in the 'Complete Report' on purchase. This section is available only in the Complete report on purchase. 1. Need to fight battles against Geoblocks and copyright infringements: Law is unclear on whether getting around Geoblocks to access restricted content actually constitutes copyright infringement. Netflix should try to be more proactive about blocking VPNs. Also many countries have much smaller content libraries than what is available to viewers in the U.S., due to licensing arrangements. Thus it’s important for Netflix to either remove content restrictions or take some measures to block VPN to prevent unauthorized access to streaming. 2. Video piracy is the reason of huge loss to the streaming and cinema industry thus punishments to the offenders should be severe: Video piracy costs billions of dollars every year and is a major concern for streaming and cinema industry. Thus stricter regulations on a global scale are required and punishment of copyright infringement should be severe. 3. Streaming on multiple devices should be checked as users are sharing their credentials to reduce cable bills: Netflix offer customers subscriptions that can stream on multiple devices at a time. Although the intent was to make it easier to go from one room to the next and continue watching a show, some customers have taken advantage of the multiple device options by sharing login information with friends and family at different locations thus reducing subscription revenue. Recently laws are made to curb this situation. Millarworld Comic Book publisher 2017 Acquisition In its endeavor to produce original content they have acquired Millarworld a comic book publisher so that they have access to more content. It is said the deal was brokered somewhere between $50 - $100 million. This is their first acquisition. Univision Television Network 2016 Partnership They partnered with Univision to broadcast the first season of their original show “Narcos” to test whether airing old seasons on traditional TV can lure people to sign up for their service ahead of the next season. Source: Company website and other reliable sources. The detailed table is available in the Complete Report. Netflix SWOT and PESTLE analysis has been conducted by Shubham Sharma and reviewed by senior analysts from Barakaat Consulting. Copyright of Netflix SWOT and PESTLE Analysis is the property of Barakaat Consulting. Please refer to the Terms and Conditions and Disclaimer for usage guidelines. Are you looking for a report which is not covered on our website? Reach thousands of academicians and corporates. Grow your business. 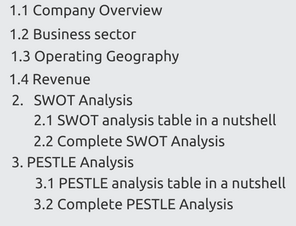 I found the analysis reports of SWOT & PESTLE.com very comprehensive and insightful. I have used them in a lot of my personal research work. Here the research is to-the-point, no beating round the bush. Cuts down my effort to surf through heaps of redundant data. This website has an amazing support team. They helped me with my custom research and delivered before time! Keep it up!! Do you want us to design a market survey or write a market research report as per your specific requirements? Reach thousands of academicians and corporates across the globe. With high ASD, your ad post will be displayed across all our 2500+ pages. Grow your business with effective advertisement! Copyright © 2019. All Rights Reserved by Barakaat Consulting.